Achieving "critic's darling" status with three well-constructed starring features, baby-faced comedian Harry Langdon became convinced that he could produce, write and direct his own vehicles, a la Charlie Chaplin. Langdon's first auteur exercise, Three's a Crowd, was a disaster; his second, The Chaser, was somewhat better, if only because Langdon returned to a domestic-comedy formula he'd utilized during his Mack Sennett days. Incongruously cast as a philanderer, Langdon is hauled into court by his disgruntled wife Gladys McConnell. As punishment, the judge orders Langdon to assume his wife's household duties, leading to the film's funniest moments. After this promising sequence, the film degenerates into an uninspired rehash of Langdon's 3-reel classic Saturday Afternoon (1925), with Langdon being led astray by pal Bud Jamison. 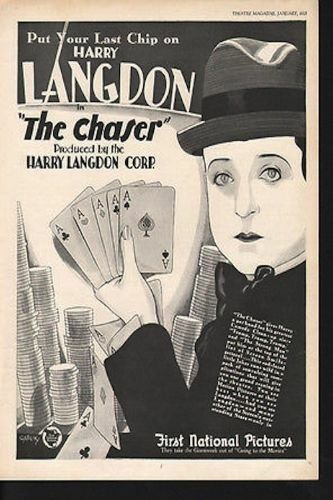 Like Three's a Crowd, The Chaser was codirected without credit by Harry Edwards and written by Arthur Ripley, two of Langdon's collaborators at Sennett. After a third unsuccessful feature, Heart Trouble (1928), Harry Langdon was finished as an independent producer.